Ireland and Ulster utility back Paddy Wallace has found himself vying with several of Ireland's leading lights during his career, with both David Humphreys and Ronan O'Gara blocking his way at fly-half at provincial and international level. Wallace was part of the 1999 U19 side that lifted the World Championship, and made his debut for Ulster in 2001. Wallace was able to slot in at either fullback or fly-half, and was called up to the Ireland A squad to face the All Blacks at Ravenhill. A broken leg sustained against Swansea in the Celtic League stunted Wallace's progress, but upon his comeback he was called up to Ireland's 2003 World Cup squad as a replacement for the injured Johnny Bell. Wallace didn't manage any game-time during the tournament, and upon his return to Ireland found his place as Ulster's fullback blocked by Bryn Cunningham. 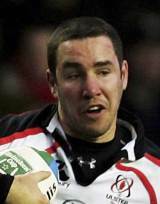 Wallace endured several season blighted by a drop in form, culminating with his relegation to the Ulster A side in 2006. At this time he returned to play for Ballymena in an attempt to rekindle some form. His return to the Ulster side was at inside centre against Borders, and after an assured display he was retained as Ulster won the Celtic League with a last-minute David Humphreys drop-goal against the Ospreys. Wallace played a big part in Ireland A's Churchill Cup campaign in 2006, starting at fly-half in wins over England Saxons and USA and in a loss to the New Zealand Maori. Wallace made his Ireland debut as a replacement against South Africa during the 2006 autumn internationals, and made his first start two weeks later against the Pacific Islands, scoring 26 points including a stunning try. Wallace made one appearance for Ireland during the 2007 Six nations before being included in the touring squad for Argentina in the summer. Wallace started the first Test but received a knee injury as Ireland lost 22-20 and missed the second Test. Wallace did enough to be included in Ireland's World Cup squad later that year, but only managed a replacement appearance against minnows Namibia as Ireland crashed out at the group stages. Following a disappointing Six Nations in 2008, Wallace made an impact on Ireland's summer tour of Australia and New Zealand, scoring a try against the All Blacks. He then made two appearances during the autumn internationals, coming on as a replacement against Canada and New Zealand. Wallace then started Ireland's 2009 Grand Slam campaign in the centre, playing four Tests during the Six Nations. And over the next two years, Wallace pushed on for both club and country. However, with the likes of Brian O'Driscoll and Gordon D'Arcy in front of him in the Ireland pecking order, Wallace struggled to hold down a regular first-team spot. In December 2012 he reaffirmed his commitment to Irish rugby by signing a new one-year deal with Ulster, although he was sidelined at the time with a thumb injury. He missed Ireland's Six Nations campaign but played an important role in Ulster's Heineken Cup campaign.